January 24, 2017 By This post may contain affiliate links. 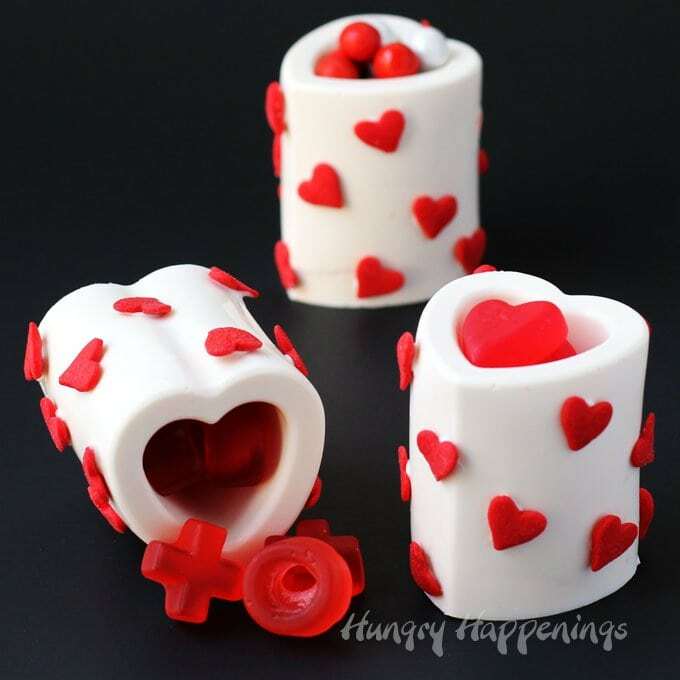 You won’t believe how easy it is to make your own homemade Chocolate Heart Cups using a silicone mold. 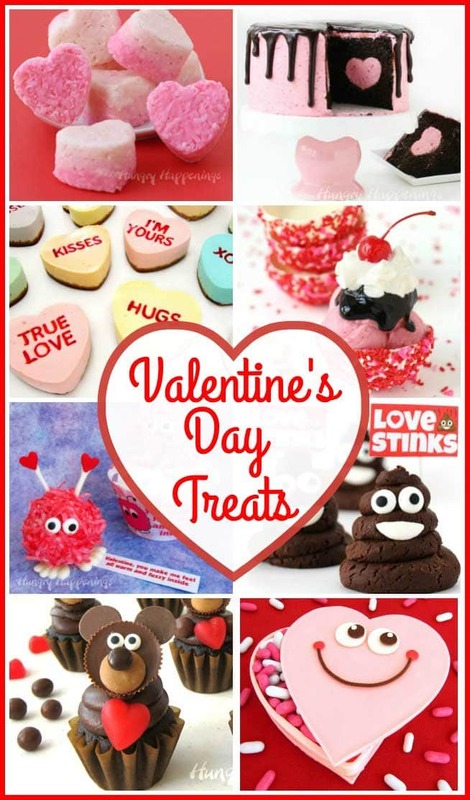 Just melt, fill, and chill then add some heart sprinkles to make them pretty and fill them with your favorite Valentine’s Day candy. Kids and adults will love them. 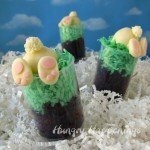 Have you used a silicone shot glass mold to create treats yet? They are so easy to use. You just fill, freeze, and un-mold. 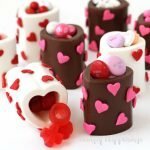 Wilton just came out with a new heart shaped shot glass mold and it was perfect for making these quick and easy Valentine’s Day treats. 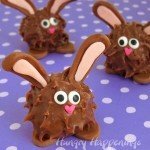 I used white and light cocoa candy melts to make this project super easy but you can also use melted and tempered pure chocolates to make these sweets taste even better. These cups would look pretty just as they are, but I thought it would be fun to add some heart shaped sprinkles to the outside. It’s a simple way to dress up these cups. I plan to give these to some kids so I filled them with a variety of Valentine’s Day candy. Small candies fit perfectly and these treats can be packaged up and given as gifts. 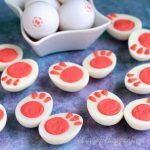 If you want to make these for adults you can fill them with chocolate mousse, cookies ‘n cream cheesecake mousse, Dulce de Leche (caramel) mousse, white chocolate cherry mousse, or peppermint mousse. You can find the items needed to make these Chocolate Heart Cups from Amazon (commission earned for sales). 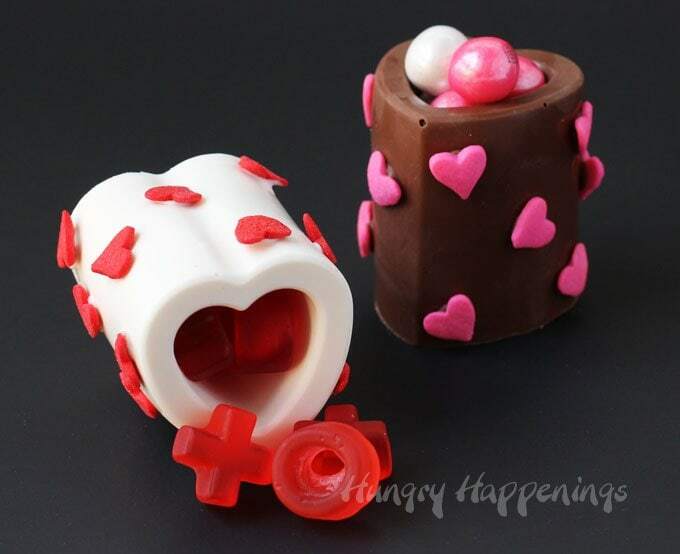 Chocolate heart shaped shot glasses can be filled with candy for Valentine's Day or Bridal showers. Pour candy melts into silicone shot glass mold reserving about a tablespoon of candy to use as "glue" to attach the sprinkles. Tap the mold to allow the air bubbles to rise to the surface. If needed, pop the air bubbles. Freeze the mold for about 15 minutes until the candy hardens. Use dabs of melted chocolate or candy melts to attach pink or red heart sprinkles around the outside of the chocolate heart cups. Here’s a quick video tutorial. 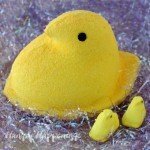 Watch how easy these are to make using the silicone mold. 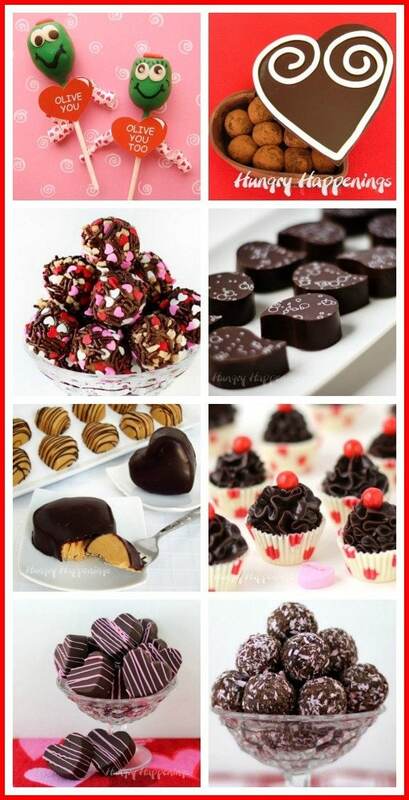 If you enjoy making your own chocolate treats for Valentine’s Day be sure to check out these other tutorials & recipes. so I can share it in my Readers’ Gallery or share it on Instagram tagging #HungryHappenings. 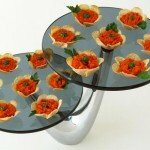 What Valentine wouldn’t want an edible chocolate cup of love? They are darling and I love all the candies you filled them with! Chocolate is always a gift I enjoy receiving too! I have seen the molds, but didn’t think i would use them, but then I see yours! 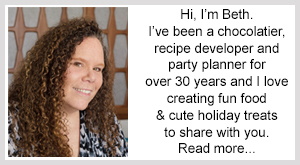 I love your heart sprinkles addition and the included filling ideas for adults! If I put them in the freezer how long should I let them come to room temp before packaging? Wait until they no longer feel cold, at least 15 minutes. 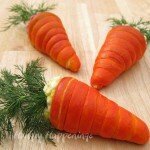 If you package them too soon they can develop moisture on them.